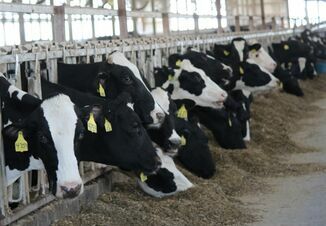 International milk prices posted their largest fall in three months in the year's first auction held early Wednesday, dragged down by a sharp drop in whole milk powder prices as an expected rally failed to materialize. The Global Dairy Price index fell 3.9 percent with an average selling price of $3,463 per ton. The index fell 0.5 percent at the previous sale. It was the first time in more than six months that prices fell at consecutive fortnightly auctions and it tempers a rise of 50 percent during 2016, as prices rebounded after two years of falls. The price index for whole milk powder dropped 7.7 percent, against futures market expectation for flat trade, following an announcement a week ago from dairy giant Fonterra that it had lifted production volumes by 5 percent. "It appears there simply weren't enough buyers willing to pay any higher prices to absorb the extra supply on offer," said Agri HQ dairy analyst Amy Van Ossenbruggen in an emailed note. Fewer bidders participated in the Wednesday auction than the average over recent months, she said. A total of 22,396 tons was sold at the latest auction, an increase of 0.3 percent from the previous one, Fonterra said on its website. 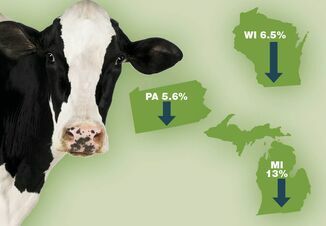 Milk fat and lactose prices also fell, while skim milk powder prices rose 2.3 percent, butter prices rose 0.5 percent and cheese prices rose 1.4 percent. 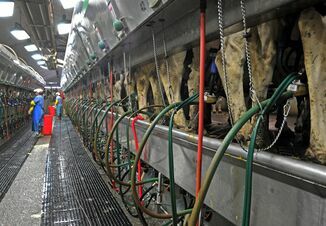 The auction results can affect the New Zealand dollar as the dairy sector generates more than 7 percent of gross domestic product. The kiwi was trading around $0.6918, down 0.19 percent, after the auction.